I noticed that once my four-year-old son started school, he started picking up bad habits. Since beginning school, my son now says, “I can’t” every time we ask him to do something. He never said that before, and my wife and I always encouraged him to always at least try. Since beginning school, my son has said some horrible words that my wife and I never taught him. We never even whisper those words in his presence for fear he might hear and repeat. Since beginning school, my son has developed a problem with sharing, even though he’s always done fine with the neighborhood kids when my wife and I are around. I think that other kids are corrupting my child. I’ve talked to some of the parents at my son’s school and asked what they thought. They’re with me. They think the other kids at school are corrupting their kids. But what can you really do about that? You can’t protect your child from all that’s bad in the world. You have to teach him or her the difference between right and wrong, smart and dumb. The other day, my son came home from school and said he wanted to turn his bike into a motorcycle. He asked for a baseball card to attach to his bike so that when the wheels were turning, the spokes would flip the card repeatedly and create a motorcycle-like sound. I never told my son about putting a baseball card in the spokes of a bike -- like I used to do as a kid. I asked my wife if she taught our son about putting a baseball card in the spokes. She said she hadn’t. So the obvious answer: My son is a genius. I mounted a baseball card to my son’s bike so that it would flip on the spokes when he rode the thing, and sure enough it made a type of motorcycle sound. My son was having a blast, racing up and down the sidewalk as if he was going 200 miles per hour. The next day, my son came home from school and said he wanted to put more cards in his spokes, and double up the cards as well to make a louder motorcycle-like sound. I never said anything to my son about beefing up the sound of his bike by doubling up cards and adding more cards along the wheel -- like I used to do as a kid. I asked my wife if she told him about that. She said she hadn’t. So the obvious answer: My son is a genius. So I doubled up the cards, added more cards along the wheel, and, soon enough, my son was riding around on what he called his “super-fast motorcycle.” He zipped up and down the sidewalk as if he was going 400 miles per hour. 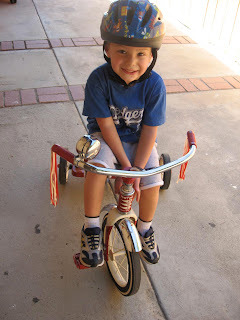 The next day, my son came home from school and said he wanted to put a piece of thick plastic in the spokes of his bike to make his “super-fast motorcycle” super-charged. Wow, I thought. I never even thought of that as a kid. What a great idea. I asked my wife if she told him about putting a piece of thick plastic in his spokes to make his bike louder. She said she hadn’t. And I thought, Wow, my son really is a genius. I found a piece of plastic that was being used as a partition between cars in one of my son’s Matchbox car boxes. I mounted the plastic to my son’s bike so that when the wheels turned, it’d flip along the spokes. My son jumped onto his “super-charged super-fast motorcycle” and took off down the sidewalk as fast as the speed of sound. And speaking of sound, the sound produced by the piece of plastic flipping against the spokes of my son’s bike was like the sound of a dragster, topped out in the red, as it roars down a quarter mile stretch of raceway. Just then I saw several spokes shoot out of the wheel of my son’s bike. Yup, they shot out like the buttons on a guy’s shirt 10 sizes two small when the guy flexes his chest muscles. And then my son munched out in some bushes near Mr. O’Brien’s house. That’s when I thought, Now what kid at my son’s school taught him that dumb trick with the piece of plastic in his spokes?